Today I brought in our truck to All Pro. This is the 5th vehicle we have had tinted by these guys. We are always satisfied with the quality, workmanship, and cost. I recommend All Pro to everyone! I also really appreciate the clean and comfortable lobby to wait it, even when the wait is not that long at all. Keep up the excellent work. Finding a good window tinting company was a lot harder than I thought. When I first did a Google search, All Pro came up first along with about 14 others in my area. Being first in a Google search doesn’t always mean they are the best. Almost anyone can give Google a bunch of money to be first in a search. After about 30 minutes of comparing various vendors, I decided All Pro was the first company I should call. In this day and age, it’s critical to have a professional looking and polished web site. Almost every other vendor I browsed either had dead links on their site or a site that looked dated and drab. All Pro’s site was clean, informative, simple to navigate and lead me to read about other services they offer even though I was not interested in anything other than tinting my vehicle. If a company represents itself like this on the web, I was very curious to get someone on the phone to see if a live interaction was consistent with their web presence. It was late, so I sent an online inquiry. I got a call the very next morning from Chris. He was very upbeat, appreciative and answered all of my questions while recommending I consider other options I didn’t mention. Although it was a 30 minute drive for me, I agreed to meet at the shop the same week so he could show me different tinting products. When I arrived, I was greeted by smiling faces and an authentic “how can we help you?”. That’s rare these days. Chris took me for a tour around and the everything I saw was just as neat, polished and professional looking as their website. Consistency is big for me. Chris demonstrated the advantages of the Wincos product because I noted my daughter complains of the brightness and heat in the back seat. After the demo, I was convinced the Wincos was the right choice for me. Nobody I met that day seemed salesy at all and were very genuine, up beat and easy to talk to. I walked away that day not buying anything, but Chris didn’t seem to mind and encouraged to call him if I had anymore questions. I didn’t call back for over 4 months. When I finally called back, I received the expected up beat and genuine greeting. I asked for Chris and when he got on the phone I said “Hi Chris, my name is Gene, I spoke to you months ago about tinting my 2011 M37s”. Chris said, “Yeah I remember you. You’ve got a young daughter that doesn’t like the brightness and heat she gets in the back seat”. His response blew me away. There were many things that impressed me about All Pro up to that point, but that kind of personal attention to customers is why I’ll recommend All Pro every time I can. Needless to say, I booked an appointment for their next available slot. The end result was exactly what I needed. My daughter can sit in the back seat without having to wear her Barbie sunglasses or have the A/C blowing directly on her at all times. It was money well spent. In fact, I called Chris days later and discussed me doing more business with them. Thanks to Chris and his entire team for being professional, attentive, informative, patient and above all….genuine. I had window tinting done on all my family room windows in 2003. The film became streaky and so the windows always looked dirty. I had mentioned this to a friend who recommended All Pro Window Tinting. Chris came out promptly and gave me a reasonable price for both removing the old film and applying a new, much better quality film to the family room windows and also to my kitchen windows. Chris helped me pick the right tint for the job and the installation was flawless. I tinted the windows to reduce sun exposure on items in the house and reduce the glare on our TV screen. I am thrilled with how much better the view is in addition to the tinting. Chris was professional, friendly and prompt and I would definitely use their services again. Hennessy Honda has been doing business with the DeLuca family and All Pro Window Tinting for over the past 20 years! Since the beginning, they have proven to be trustworthy, competitive, and professional in their quality of installs and knowledge of product, as well as their professionalism with our clients. They have not only tinted our vehicles but they have also tinted our showroom, service drive and various internal glass as it was necessary. 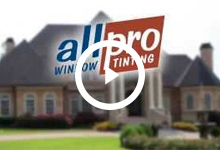 We have tried other companies during this timeframe but we have always come back to All Pro Window Tinting. There is not another window film company that we would recommend for this process nor one that aligns with the continued commitment to customer satisfaction required by the Hennessy organization. We are as committed now to APWT as ever, and we look forward to another 20 years of great service and mutual customer satisfaction. I selected All Pro window tinting for my beach house. Wish I had done it years ago, but all I can say is thank goodness I finally got around to it. What a difference, you could feel an immediate drop in temperature inside the house. I didn’t think the view of the beach could be any better, but honestly looking through the tinting, the colors are brighter and everything just looks clearer. The product is amazing, but equally important was the quality of service. Chris and the whole team were so responsive. They worked around my schedule and made the entire process so easy. I was so impressed that I have recommended them to my place of business, and I think that says it all. G & E Construction has used All Pro Window tinting on a couple of projects this last year. They are definitely the company you want to hire if your looking for a professional job. Chris DeLuca was very thorough with all the details required on each project. 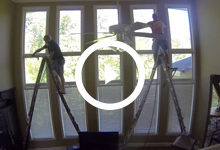 His guys are very neat and precise with cutting window films. Their services are superior to other companies we’ve worked with in the construction industry. We are very pleased with their services and would highly recommend all Pro Window Tinting. Their name truly says it all! I started working with Chris and the All Pro Window Tinting team during the opening of Bistro Niko. Since then All Pro has done several different jobs for us, each time providing the needed expertise, guidance and quality that others have fallen short in the past. Chris and his team have always been incredibly responsive to our needs and understand the true value of partnership. All Pro Window Tinting gets my business every time. Over the last few years they have tinted my office, home, and cars. When APWT tinted my office it made a huge difference in cutting the glare and making it more comfortable for everyone. They definitely take care of their customers. When we had a contractor break a window on our home Chris repaired the window even though it was a rather small job. He was glad to do it.